Toronto is home to several major stadiums such as Rogers Centre and Soctiabank Arena, which regularly attract A-list acts, but it’s the city’s smaller and mid-size venues that provide a more intimate listening experience and one that helps you feel more connected to the music. Smaller doesn’t mean any less exciting, and the venues listed all bring great music to the city, from those aforementioned A-listers, to up-and-coming acts that might just turn out to be your new favorite band. Looking to see a live show in the city? 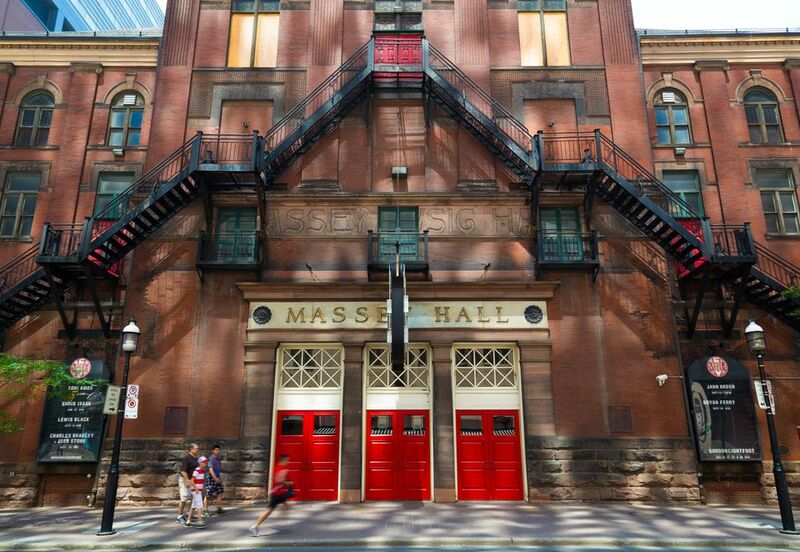 Here are 10 of the best live music and concert venues in Toronto. Probably Toronto’s most iconic live music venue, Horseshoe Tavern has been around since 1947. The property itself dates back to 1861, when it opened as a blacksmith shop. Since then, the stage at the “Shoe” as it’s affectionately known, has hosted some of the biggest names in music, from The Rolling Stones to the Police. The venue is known for championing independent talent and many of Canada’s best bands have been booked at the venue. The space itself is bare-bones, but you’re there for the music. There is some seating available, but for the most part, patrons are usually standing. Clocking at 18,000 square feet of space spread over two floors, the Phoenix is one of the city’s largest concert clubs. Opened in 1991, the venue is comprised of the main concert space and a mezzanine level. There’s lots of standing room, so even if a show is sold out, it never feels claustrophobic. The venue hosts a variety of shows comprised of all genres, as well as dance parties. No matter who’s playing a show (be it an indie-folk performer or a rock band), the sound is equally clear and the space seems to mold itself to whomever takes the stage. Originally constructed as a movie theatre in 1919, the building that is now the Danforth Music Hall was originally known as the Allen’s Danforth (named for its owner the Allen Theatre Chain). The theatre added the “Music Hall” name when it started featuring live shows in the late 1970s. The venue was renamed The Danforth Music Hall in 2011. What you’ll see here are an eclectic mix of genres and the hall accommodates both fully seated shows as well as general admission shows with standing room on the main floor. This basement venue and saloon-style bar has been packing in music fans since opening their doors in 2006. You never know what you might see on any given evening, but music here mostly leans towards rock, alt country and bluegrass. Since the space is intimate you can expect great sound and there are tables towards the back if you don’t feel like standing. Shows here are lively and fun without being overly raucous. Sometimes they also offer a bluegrass brunch, which is exactly what it sounds like – live bluegrass accompanied by a hearty brunch. One of Toronto's most popular live music venues, the Opera House is a 12,000 square foot concert hall in Riverside. Acts here lean more towards punk, metal and rock, which the venue is well-suited for. State-of-the-art lighting and sound equipment ensure a high quality experience and in terms of atmosphere, the venue maintains the look and feel of its original 1900s vaudeville theatre architecture. There’s also a restaurant and patio on site. Another basement venue, Junction City Music Hall can be easy to miss. Tucked away in Toronto’s Junction neighborhood (hence the name), patrons need to head along a narrow hallway and down a set of stairs to reach the space. Expect up and coming acts here covering a wide array of musical genres. There are booths for those who want to sit and a good size dance floor for anyone who wants to get moving. The bar serves up craft beer and if you’re waiting for a show to start, vintage arcade games and pinball tables are available to pass the time. This mid-size venue is one of the best in the city thanks to the acoustically-rich space. It’s also a National Historic Site of Canada that hosts some of the biggest names in music covering everything from rock and jazz, to contemporary acts, as well as comedy and more. The building itself, being rich in history, is an experience in itself to see. Seats are comfortable and placed so that you can see and hear from almost anywhere. There is seating for up to 2,765 patrons so the venue can hold a fair amount of people while retaining an intimate atmosphere. This venue, with its iconic graffiti mural front, has been open since 1985. The building itself was originally opened as a movie theater in the 1950s, but now Lee’s Palace is one of the city’s most popular places to catch a live show. Located in the city’s Annex neighborhood, the stage here has seen the likes of renowned bands like Nirvana, The Smashing Pumpkins, Red Hot Chili Peppers and Oasis (to name a few). The venue is on the smaller size, but high ceilings give the impression of a larger space. This is the place to come rock out as most shows are high-energy. If it’s an intimate experience you’re after, Hugh’s Room, in Toronto’s West end, is the ideal live music venue. The warm and welcoming space hosts a variety of acts that veer towards folk-rock, but you might also catch a jazz or rock show, depending on the night. You can either simply get a ticket to enjoy the music, or opt for dinner and a show, which guarantees a seat. The Rex has been a go-to venue for jazz lovers for over 40 years, presenting 19 shows every week. The casual atmosphere is conducive to lingering over a drink while watching whomever might be performing that night. There’s also an on-site restaurant as well as a simple but comfortable hotel for any out-of-town jazz fans who might be in the city to catch a show. In terms of who you might see, the club is known for hosting both big name and up-and-coming acts.